Your Ning profile page has a Comment Wall, where other Ning members can leave you messages. 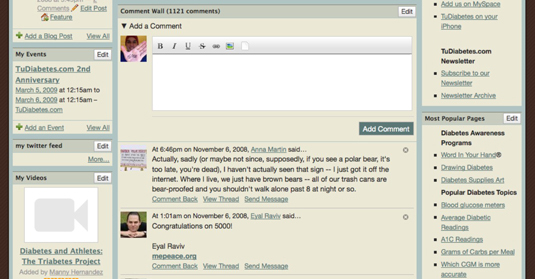 The Comment Wall lets members write something to you, include a link to another Web site, embed video from the network or other sites, or post a photo for you to check out. Click the Settings link at the top-right of your main Ning page. Click the Privacy link on the left. 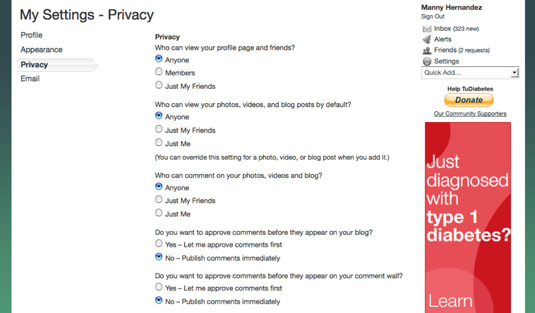 Specify a setting for the Do You Want to Approve Comments Before They Appear on Your Comment Wall option. Essentially, if you select Yes, you set up your Comment Wall so that you have to approve all comments before they’re displayed. Click the link provided by the notification. A new page opens, where you can view the comments. 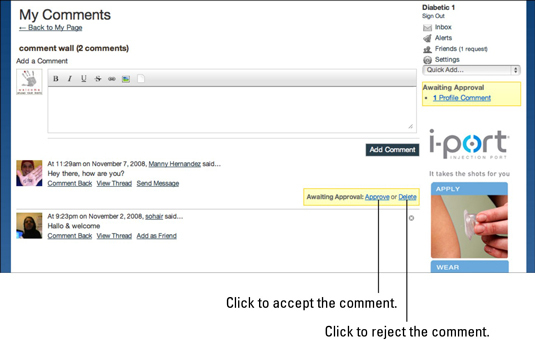 Click the appropriate button to either approve each comment or reject it if you don’t want it to appear on your Comment Wall. You can also view comments that are pending your approval by going to your profile page and scrolling to the Comment Wall section.